One of the things I like about Laura Griffin's Tracers series is how readily the world reminds you that the series and the characters are bigger than just the fictional Delphi Center. The Delphi Center, known in the Tracers world as the best forensic crime scene lab in the nation, is an ever present background factor in Tracers. But I like that Griffin shows us that all of her books don't depend on the Delphi Center to forward the investigative progress of her stories. If any of that above makes any sense to anyone, then kudos. Because I'm not entirely sure what point it was I was trying to make. Of course, I guess I was just trying to point out that I liked that we get to see a CSI from local law enforcement who is just as intelligent and competent as all the prodigies working at the Delphi Center. Or something like that. So my second point in this rambling introductory is to say that: One of the other things I love about Laura Griffin's Tracers series is how easy it is to get hooked into the action, the suspense, and the entire criminal mystery of it all. And also how easy it is to like all of our characters. Deep Dark was readily entertaining, and it was definitely a page-turner once I had time to finally dive into it. And aside from a few quibbles here and there, and also aside from some conflicted feelings about the romance, I very much enjoyed this book. Delaney Knox is a white-hat hacker working for the Delphi Center's cyber investigative team. She's good at what she does, using her skills to help uncover some of the most heinous cyber crimes surfacing with the present-day advancement in technology. When a woman is murdered, Laney can't help but notice the similarities between this case and her own assault years ago; because of this, she decides to slip the leading detective Reed Novak a few clues to point him in the right direction. There is a connection to a dating website called Mix.com that Laney is convinced will lead Reed to the killer. But this link is still a flimsy one until another woman turns up dead in a similar manner, and another previous murder is brought to light, cementing Laney's theory. However, as she inserts herself into the murder investigation, it doesn't take long to realize that she's just put herself in danger. Because the murderer is a sophisticated computer tech much like herself, and it's possible he's following and watching her every move. I like the concept of cyber crime investigation. It sounds pretty damn cool! That was one of the reasons why I'd been looking forward to reading this latest installment of Laura Griffin's Tracers series. The only other romantic suspense I've read so far that involved forensic cyber crime investigation was the Black CATs series by Leslie A. Kelly, which highlighted a specific FBI department that investigated violet crimes committed with the aid of advanced computer technology. Aside from that, some previous Tracers books had touched upon the use of computer technology to solve other crimes, but Deep Dark is the first book in this series to place the focus on cyber crimes committed with the aid of modern computer technology. The idea of it, if you really think about it, is enough to make anyone paranoid. To think that there are hackers out there capable of doing the things our serial killer in this book can do might make you want to strengthen those firewalls and change your passwords. It's a scary thought, you know--to think that a simple application into some social media network would be enough to bring a stalker to your physical door in real life. As many others have said: Anything you post on the internet is seen by all an never goes away. 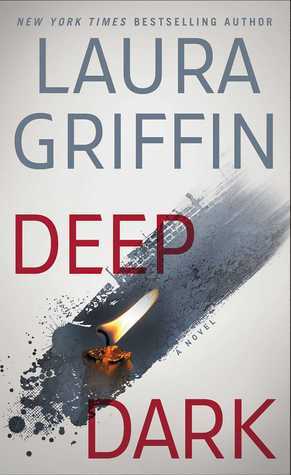 Anyway, Deep Dark, much like the rest of Laura Griffin's books, is highly enjoyable and exciting. The action starts immediately and the investigative aspect is engaging. The tone of the book itself feels a bit detached, but I'm not sure if it's just because nothing really stands out outside of the forensic cyber investigation and Laney's personality. As per usual, the romance feels almost too standard. Even with Laney's withdrawn, introvert character, she doesn't stray far from the typical feisty heroine of most romantic suspense books. I love that she's kind of a geek in her own way; but I don't like that she's not immune to the same TSTL moments we love to hate heroines for because we definitely know that she should have known better. Reed Novak is just the usual hardened, broody, alpha male detective who needs to be in control of everything, especially the woman he's sleeping with. It bugged me that everything was fine and dandy until the couple's relationship changed. Then all of a sudden Reed was not okay with Laney helping with the investigation because he decided to turn caveman on her. But then he'd turn around and consult with her on his investigation anyway, even after pulling her off of it. The guy was kind of pushy and it made me a little irritated that Laney didn't seem to mind his irrational pushiness and let him get away with it. But otherwise, Deep Dark was a very entertaining read. We get to see old characters and new characters, which is always great, because Griffin seems to have picked up a knack for including side characters and making them significant without making their scenes forced. I like that, and I look forward to whichever character will be the star of their own story next. I really need to try this series! Sounds great! It's pretty exciting, although I would still warn that the first few books are kind of mediocre. It wasn't until book #4 that I REALLY started liking this series. Laura Griffin's writing seems to improve with each book, which is always awesome. I enjoyed this one. It was my first time reading the Laura Griffin's work and I was impressed with how detailed she was. If you liked this one, I also recommend the rest of the Tracers series, although the first couple books are mediocre. Laura Griffin's writing gets better as each book in the series progresses, but there are still some similar plot lines used.